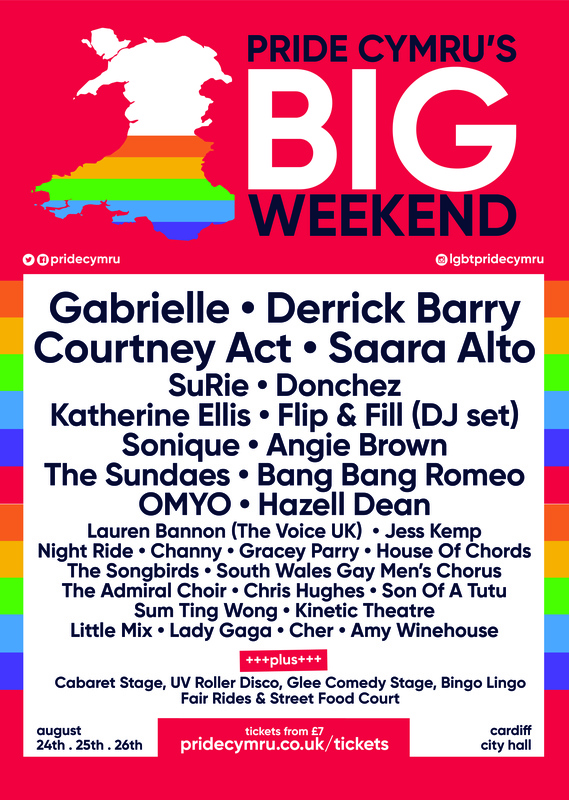 Derrick Barry, Courtney Act, Sonique and Gabrielle are amongst this year’s acts who will be performing at Pride Cymru’s Big Weekend on 24 – 26 August 2018. Drag performer, Derrick Barry, is widely known for impersonating Britney Spears, competing in the third season of America’s Got Talent, and the eighth season of RuPaul’s Drag Race. Celebrity Big Brother 2018 winner Courtney Act is an Australian drag queen and pop singer, who first came to prominence in 2003’s Australian Idol. BRIT Award-winning singer, producer and DJ, Sonique, is best known for her 1998 international hit single It Feels So Good. Gabrielle is an English singer songwriter Gabrielle is best known for her 1990s singles Dreams and Going Nowhere. Other performers include Flip & Fill, The Sundaes from BBC’s All Together Now, X Factor’s Saara Aalto and Laura Bannon from The Voice UK. The Big Weekend is a celebration of inclusivity and diversity, held annually by Pride Cymru. 40,000 people are expected to attend the event on Cardiff City Lawns over the weekend. On Saturday 25 August, a parade will take place around the streets of Cardiff, which will see 10,000 people walk the mile-long route in the city centre. Families, individuals, groups and organisations all are welcome to join the parade to showcase the true diversity and equality across Wales. There will also be entertainment from Glee Comedy Club, a Cabaret Stage, a UV Roller Disco, a Bingo Lingo takeover and beach party. As well as this, there will be food and drink and market stalls at the family event, which will run on August Bank Holiday weekend. The theme for this year’s event is #ProudToBeMe. The campaign aims to encourage members of the LGBT+ community and beyond to use their voice and be proud of their identity. The full line-up and tickets are available at pridecymru.co.uk.